For Mary Sullivan, Christmas is, and always has been, about family. And this year is no different. As she awaits the arrival of her eight children and their partners at the cottage in Lake Tahoe, she hangs the ornaments that they made for her over the years. Each decoration brings with it a tide of memories, all of which she holds dear to her heart. But when she comes across the oldest ornament, the one her beloved husband, Jack, gave her on their very first Christmas together, Mary is immediately swept back to the first days of their whirlwind romance, to the love that would be the foundation on which they built the family she is so proud to call her own. I made it through. This last book is a fitting capstone. It brings Mary Sullivan back to where she meets the love of her life Jack. As with all other novels, the romance is fast and takes place within minutes of the opening chapter. It a nice story. The tension in this story is far less in the previous eight books because you know what is going to happen. You are going to need Kleenex to get the Prologue so be forewarned. I know there are a Sullivan series in Seattle and in New York. But I am going to take a break for a few months and let the series settle. Mary and her family was too perfect. If I go and start the other ones, I can't help but wonder if I'll be let down or angry that I won't hear about the exploits of the San Fran Sullivan. Give this a listen. Started out well . . . but I could hardly finish it . . . I like romance as much as the next person, but I can only listen to so much kissing and touchy/feely . . . the story lacks any depth or character development . . . this one is WAY too shallow for my taste . . . if you left out the love making scenes, it would last about five minutes . . .
Story Thoughts: Kissing Under the Mistletoe was a bittersweet read that had me crying both at the beginning and the end. Fans of The Sullivans series already know what is happening in the present day but it was wonderful to get Mary and Jack's love story. In fact, I have to say it is my 2nd favorite in the series. Perhaps it was knowing what their love created already but their instant connection worked for me (that is rare). Their whirlwind romance swept me off me feet and made me swoon. This is a fantastic Christmas read and I would highly recommend it to all fans of The Sullivan series. Eva does a great job with The Sullivan series. She has the right emotion for these really deep and moving contemporary romances. I love the extra "emotion" she adds during the "falling in love" time. She also has great timing for the humorous parts. Final Thoughts: I recommend Kissing Under the Mistletoe to anyone who has read even just one book in The Sullivan series. Mary's story is to good to pass by. Where does Kissing Under the Mistletoe: A Sullivan Christmas rank among all the audiobooks you’ve listened to so far? This was my absolute favorite book of all the series, because it was the first book that really developed the characters. This should have been the 1st book in the series. I have LOVED every book in this series ad listened to them all twice. This book is at the top of the list for sure. The story of Jack and Mary was so incredibly sweet and romantic. To see the beginning of the Sullivan family was wonderful. It just tied in all of the kids stories so wonderfully. Can't say enough how great this book is! Loved it - best book in the series! The others were good, but this one......wow! 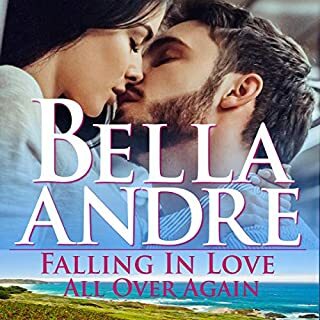 The story felt like someone said write a story about Mary and Jack, so that is what Bella Andre did. So it was just an okay story, which Bella put together. This was the best story of all the Sullivan's. I couldn't put it down. The ending brought tears to my eyes. Loved it!! Would you consider the audio edition of Kissing Under the Mistletoe: A Sullivan Christmas to be better than the print version? Nothing like reading a real book is true but in this case I didn't miss it because Ms Kaminsky brought the characters to life with ease. I have enjoyed this series but this particular book with its background story of how it all started with Jack and Mary made me see them in a total different light. I have known Mary Sullivan as the devoted mother forgetting that she is also a woman. Jack Sullivan's strong ethereal presence was more like that of kindly ghost until I met him 'flesh and blood'. Kind of like listening to grandma and grandpa telling how they met, that's what it felt like for me. Mary was a world class model, Jack a technology wizard. One look and wham! Love at first sight. However there were a few obstacles which Mary had to conquer and Jack, loving, patient Jack stood by Mary as she sorted herself out. Ms Andre writes feel good books and this one made me smile more often than any in the series. What other book might you compare Kissing Under the Mistletoe: A Sullivan Christmas to and why? I compare this book and this series to that of Sherryl Woods' Sweet Magnolias which I have enjoyed and continued to do so. Ms Kaminsky gave voice to the characters and what a difference it makes when is done well! Every time Jack put Mary's needs above his I found myself more in love with him, just as much as Mary. Lucky the woman who can count on love this wonderful. As with all the books in the Sullivan series, this one was another joy. I have read most of them, and the keep getting better.